Empty the contents of the tomato can in a mixing bowl and coarsely crush the tomatoes with a fork or your hands, leaving them a little chunky. In a heavy bottom 2-quart saucepan over medium heat, add the olive oil and onions. Saute until slightly translucent. Add the garlic and saute about a minute until golden. Quickly add the tomato paste (stirring) and crushed tomatoes to the mix. Stir well and bring to a simmer. Season with salt and pepper, add the dried or fresh basil, Italian seasoning, and oregano. You can add a touch of sugar if desired or if tomatoes are tart. Simmer on low, stirring often for about 20 minutes. If not using right away, cool down and store in airtight container in the refrigerator, up to 1 week. Place flour, yeast, sugar and salt in a power mixer bowl and mix until well combined, using a dough hook. Add warm water (start with 2/3 cup, you may not need the full 3/4) and mix at low speed until dough is soft and elastic and does not stick to sides of bowl. Dough should be stiff. If it is sticky, add a little flour. It should spring back if pressed with finger. Cover and let rise in a warm place until double in size. When ready, pat dough into a medium-sized, non-stick cookie sheet until the pan is covered and up the sides about a quarter inch to form an edge. It will seem like it won’t quite fit the pan, but keep patting, and pressing, and it will fit. Brown your chosen meat and saute any toppings you like to have pre-cooked (like mushrooms) and make your sauce. For the sauce (above), mix all ingredients and simmer 20 minutes. 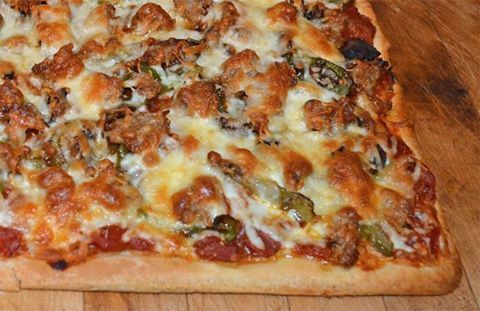 Spread desired amount of sauce and toppings evenly over crust. You may have some sauce left over, depending on the size of your pan. Bake in a 425 degree F. conventional oven (375 F. for convection). Pre-bake crust for 15 minutes before adding toppings, then return to oven to finish baking for about 20 minutes or until edge of crust is browning and cheese is turning golden. Tip: Using a spatula, lift up a corner and peek at the bottom of the crust. It should be golden. 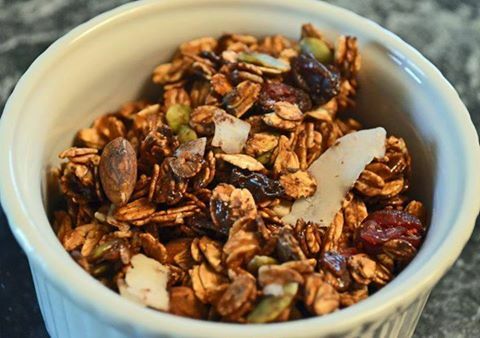 Place the granola, shredded coconut, pumpkin seeds and dark chocolate chips in a bowl. Meanwhile, melt peanut butter, honey and coconut oil over medium-low heat Stir until combined. Add vanilla. Remove from heat and while hot, pour peanut butter mixture over the granola/chocolate mixture. Stir until chocolate is entirely melted. Pour into a greased 9×13 pan and cool in the fridge. When it’s set, cut into bars. Optional: Line the cake pan with greased parchment paper for easy removal of the set bars. Then you can cut them more easily on a board rather than in the pan. Other optional additions: Add 2 T ground flax meal and/or 2 T lecithin to dry ingredients. Finished bars will keep for weeks when kept refrigerated in a sealed container. I like to wrap them individually in wax paper or plastic wrap. 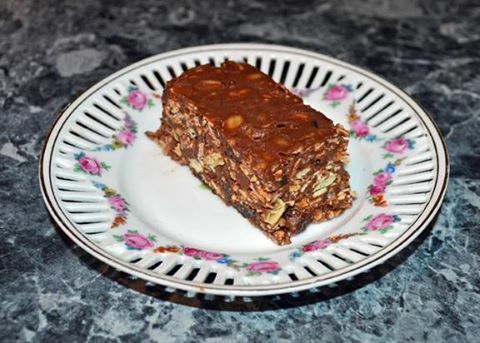 When I don’t have granola on hand, I usually substitute mini shredded wheat squares and chopped dates (this is as good or better than my original recipe). Place uncooked oatmeal in a large mixing bowl. Heat jelly and oil in a small saucepan until bubbling. Remove from heat and add salt and vanilla. Pour jelly mixture over oatmeal and stir to coat well. Divide in half and spread evenly on two cookie sheets lined with parchment paper. Bake in a 325 degree oven until medium golden brown, stirring twice to assist in even coloring. Bake time varies between 15 to 25 minutes. Oatmeal flakes will be crunchy. Remove from oven and place in large mixing bowl. 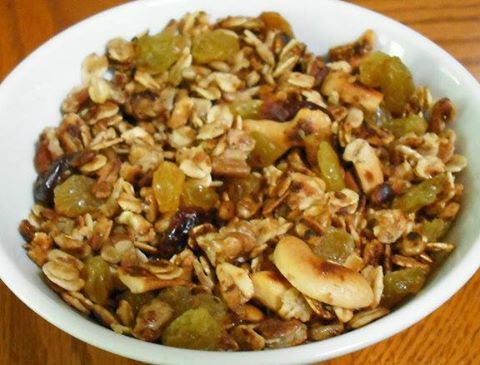 Add trail mix, stir well and cool completely before storing in a tightly sealed container. (I prefer a natural trail mix with almonds, pumpkin seeds, sunflower seeds, coconut flakes, raisins, dried cherries and a few semi-sweet chocolate chips that I get from a local natural foods store. 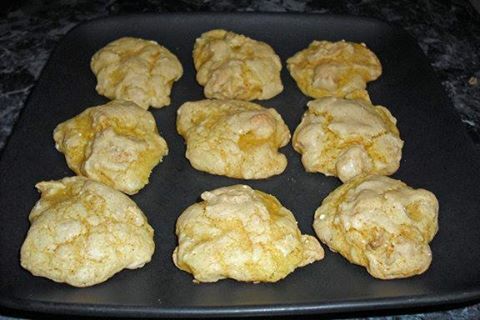 These easy to make, fresh tasting, lemon-flavored cookies are ready to serve in 30 minutes, start to finish: 5 minutes to prep, 10 minutes to prepare, 10 minutes to bake and 5 minutes for clean-up. What could be better, bake and take in half an hour. That’s less time than it would take to make a quick stop at a grocery store to pick up something to bring to the 4th of July picnic this weekend! Still not easy enough for you? They can be made ahead and frozen until you need them. The best part is, they’re new, they’re different, they’re delicious and no one else will have anything like them. Preheat oven to 350 degrees and line 2 cookie sheets with parchment paper. Spray with non-stick cooking spray. Combine all ingredients in a bowl and mix well with a spoon. Batter will be medium-stiff. Drop by teaspoonfuls onto prepared cookie sheets. Bake 10 minutes. Makes 48 cookies, 48 calories each. Preheat oven to 350 degrees F. Bake pie shell for about 10 minutes, or until lightly golden. Lightly saute the chopped onion until translucent and cool. Set aside. Drop tomatoes into a pot of boiling water. Then place in cold water to cool. Peel away skins. Halve tomatoes and squeeze out seeds and excess water using a clean towel or paper towels. Chop. You should have about 3 cups of chopped tomatoes. Toss with 2 T flour. 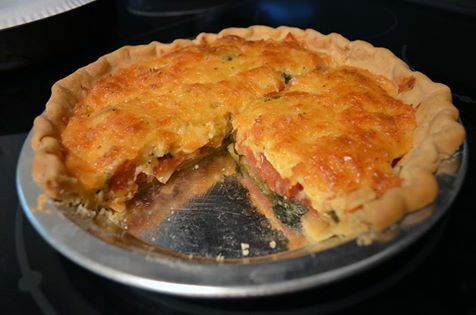 Sprinkle the bottom of the pie crust with onions, then add basil followed by tomatoes. In a medium bowl, mix together the grated cheese, mayonnaise, hot sauce, and a sprinkling of salt and pepper. Spread cheese mixture over the tomatoes. Place in oven and bake until browned and bubbly, about 30-45 minutes. 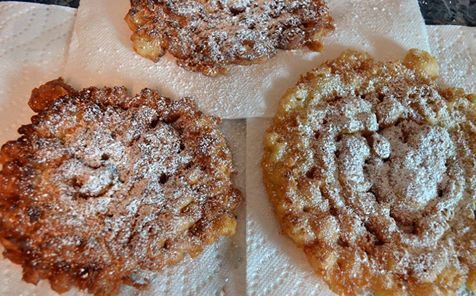 Make your own funnel cakes all year long. In a mixing bowl, combine eggs, milk and vanilla. Sift dry ingredients together and add to egg mixture beating until smooth. Test batter to see if it flows evenly through funnel. If too thick add milk, if to thin add flour. Pour about 2 cups cooking oil (about 1-inch deep) in an 8 inch skillet and heat to about 360-375 degrees. Cover funnel tip with finger and add about 1/2 cup of batter to funnel. Uncover funnel tip and release into hot oil in spiral patterns. Cook one at a time, frying until deep golden (about 2 or 3 minutes). Flip and fry other side (about 1 or 2 minutes). Drain on paper towels and lightly dust with powdered sugar. Serve immediately in paper towel to outstretched hands.